The delightfully weird Shin Megami Tensei: Persona 4 is being adapted yet again. This time, into a stage show. So, let's count the various Persona 4 tie ins, shall we? We've got a manga, an anime, a remake for the upcoming PlayStation Vita and an absolutely, drop-dead-gorgeous fighting game. Now we can add "bizarre live action stage show" to the list, with the announcement of Persona 4: Visualive. The show, which of course stars a glut of gorgeous Japanese talent, opens at the Sunshine Theater in Tokyo next March. 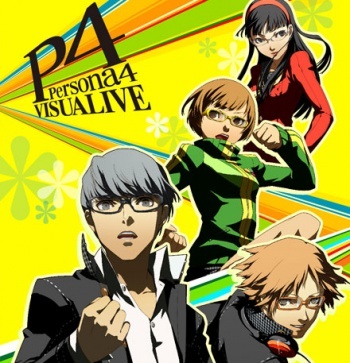 As in Persona 4, the story follows a bunch of smugly fashionable teenagers in a rural highschool, as they deal with the pressures of school life and try to avoid being murdered by a magical television, it get's weirder, and more utterly compelling, from there. Persona 4 won't be the first video game to make the jump to the stage. Capcom's popular Phoenix Wright series was adapted into an all-female musical back in 2008, which went on to be incredibly well received. It never received an official English release though, hopefully Persona 4 Visualive makes it across the pond.